Syria’s government has condemned the capture of Afrin by the Turkish military, calling on Ankara to “immediately” pull out troops from the northwestern Syrian city. “Syria condemns the Turkish occupation of Afrin and the crimes it is committing there, and demands the invading forces immediately withdraw from the Syrian territory they occupied,” the ministry said in its letters, according to the Syrian official news agency SANA. “Turkey’s behavior and attacks do not only threaten citizens and the unity of Syria’s land and people — they also prolong the war on Syria as a service to terrorism and its supporters,” it added. The remarks were made a day after Turkish soldiers, backed by members of the so-called Free Syrian Army (FSA) militia, captured the city from Kurdish militants, particularly those of the People’s Protection Units (YPG). Damascus has on several occasions criticized Ankara for its military offensive on Syrian soil, accusing it of supporting “terrorist” groups. Turkey launched the so-called Operation Olive Branch in Syria’s Afrin on January 20 in a bid to eliminate the YPG, which Ankara views as a terror organization and the Syrian branch of the outlawed Kurdistan Workers’ Party (PKK). Over 280 civilians have lost their lives since the offensive began, according to the so-called Syrian Observatory for Human Rights (SOHR). Turkish President Recep Tayyip Erdogan vowed on Monday to further expand military operations against Kurdish militants in Syria to the eastern parts of the Arab country such as Manbij and Ayn al-Arab or Kobani. “Operation Olive Branch” is Turkey’s second major military intervention in Syria during the unprecedented foreign-backed militancy that broke out in the Arab country in 2011. 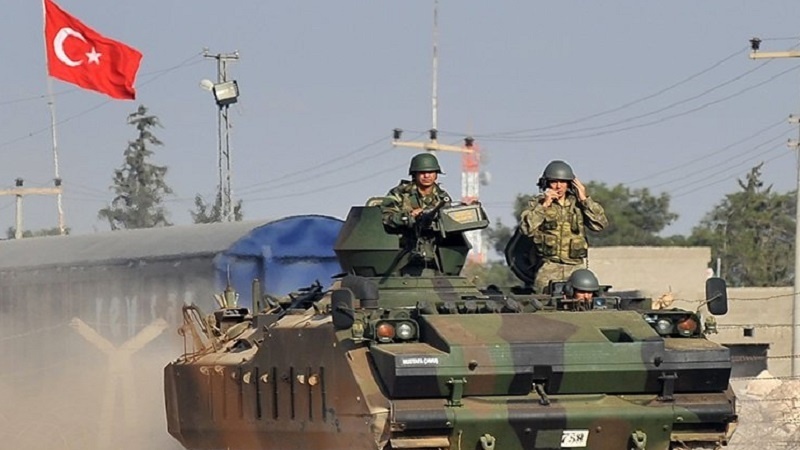 In August 2016, Turkey began a unilateral military intervention in northern Syria, code-named Operation Euphrates Shield, sending tanks and warplanes across the border. Ankara claimed that its military campaign was aimed at pushing the Daesh Takfiri terrorist group from Turkey’s border with Syria and stopping the advance of Kurdish militants, who were themselves fighting Daesh. Turkey ended its campaign in northern Syria in March 2017, but at the time did not rule out the possibility of yet another military offensive inside the Arab country.